Long before the days of skipping chapters on a DVD or streaming an entire movie on Netflix, VHS video was a rising technology among the masses for their dose of culture. Among the very places that you could find such a relic was the local video store. In Akron, plenty came and went, but Roadrunner Video was among the most memorable for any movie lover like myself. The once prosperous local franchise boasted twelve local chains that garnered quite the reputation for the increasing attention to video and VCR sales. Roadrunner not only kick-started the dawn of the video store, but it embraced it with several hard-to-find titles, as well as the most dependable of places to find your favorite movie posters. A virtual library of visual stimulation for the masses that craved the gore of horror, the destruction of action , the feel-good laughs of a comedy, or the sensuality of the behind-the-curtain section. More on that later. This was the place where dreams were rented out at 1,2 or 5 days at a time, and its endless supply of stocked shelves provided one of the most memorable places where my love for film could occasionally get out of its cage. If I remember one thing from my frequent visits to Roadrunner, it was the visual delight of a place that took pride not only in embracing the best styles of the 80’s, but the very cult-like feel for where B-movies go to prosper for eternity. The neon decals around the store lit up the interiors with pink fluorescence, giving off a feeling of entering another dimension from the very one I stood on at North Main Street. Upon opening the door, a smell of fresh plastic filled my nose as a result of the hundreds of video cases that surrounded a room as big as any you have ever seen when you are seven. I used to associate such a smell with a video store, and even today will get that faint whiff from time-to-time, and it freezes me dead in my tracks, longing for an easier time. What was great with such a local-run business is that the door to employees was never revolving. Every week, I saw and talked with Randy, a teenager who I viewed as the single coolest entity in my pathetic Pee-Wee Herman filled life. Randy felt like family to us, and that’s certainly something strongly lacking in today’s businesses. This was also the place for my biggest showdown with my arch-nemesis every week: Antie the Bug. Antie was a prop from the movie “Honey, I Shrunk the Kids”, and Roadrunner would set this enormous ant to the right of their cash registers so it could peer into the eyes of every nightmare-tortured child like me. Every week I would run past Antie, so not to stand face-to-face with my greatest fears. The bug never came down throughout my childhood, and eventually its appearance started to decay, due to aging paper mache and neighborhood vandals. It was around this time when I took my biggest steps to bravery in my life. I was around the age of ten, and I decided that enough was enough. I remember riding my bike down to the store. I was all by myself, with no intention of checking out a movie, just to handle business. My heart was beating a million beats per second, when I opened the door with authority, walked right up to Antie and said “I can’t be afraid of you anymore”. Not the bravest of speeches, but it was my “Citizen Kane” moment. was quite the concept for a kid who viewed them as “Cootie-holders”. 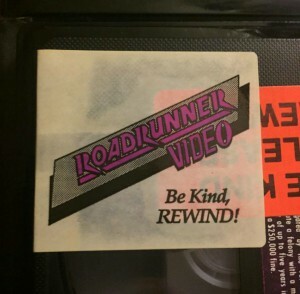 In many ways, Roadrunner Video took my innocence that day and never gave it back. Which could explain why video stores aren’t as popular today in the ever-growing field of protective parents. Throughout the years, evolving technology kept on moving, and competition was on the horizon for Roadrunner Video. After invaders like Blockbuster Video and Hollywood Video staked their claim on the Rubber City, the days were numbered for the dwindling local chain. By 2005, all Roadrunner Videos were out of business, and I was left with a lifetime of memories, as the pink neons went off for one last time. On the final day, I remember a nearly empty room and a feeling of defeated dread that overtook the once beautiful spirit of such a place. That day, I purchased a copy of “Bubble Boy” for $3. Not my proudest moment, but it was the least I could do for a place that acted as a third parent in my life. A place where I conquered my fears and embraced women as equals. A place where it was kind to rewind, a philosophy that we could all use upon reflection in our lives.